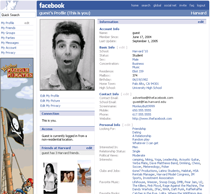 I’ve long been intrigued by FaceBook, the fantastically popular social network site for college and university students. FaceBook raised about $500,000 from Peter Thiel in an angel round, and $12.2 million from Accel Partners in April 2005 (at a rumored valuation of around $100 million). I’ve read the articles that describe a vibrant and growing social network, but lamented that I simply could not get in to it! To get past the login page you need a valid .edu college/university email address, and I am not a college student. More news came out last Friday, September 2. FaceBook began allowing high school students to join the network, significantly increasing their target market. I emailed FaceBook over the weekend and requested an interview. Chris Hughes wrote back and said he’d be delighted. We spoke today. And Chris, great guy that he is, gave me access to the site via a demo account. I was finally able to see what FaceBook was all about. By the way, the screen shot above is the demo account profile. The Kramer picture is a nice touch, I think. This will be a longer than normal post since most of us can’t simply try the service out for ourselves. I’ve organized my notes under the subjects of “membership,” “functionality,” and “business model”. To become a college member of facebook you must have a .edu college/university email address. Most colleges issue these to students. Facebook supports 882 colleges today – there are about 2,000 in the U.S. if you count community colleges. Their goal is to support all of these over time. The penetration rate is staggering – about 85% of students in supported colleges have a profile up on FaceBook. That’s 3.85 million members. Chris tells me that 60% log in daily. About 85% log in at least once a week, and 93% log in at least once a month. With the addition of high schools – there are approximately 22,000 in the U.S., Facebook’s target market increases substantially. Chris tells me “tens of thousands” of high school students have joined since the functionality was launched last friday. Becoming a member as a high school student is a bit easier. High schools generally do not issue email addresses, and so there is no requirement for an active .edu email account. Current high school members can invite others. Once you start college, you have the opportunity to change the account over to whatever school you attend. Also, Chris tells me that recent alums (who can remain members) are maintaining the same log in rates as current members. The demo account profile can be viewed here. In addition to basic personal information, users are encouraged to add additional descriptive information about themselves to build out their identity. Users can add favorite music, books, movies, quotes, etc. Every entry is linked to search results where users can see others who share the same interests. Users can also form and/or join groups. Examples are political and social groups. However, about 80% are “fun” related, such as “I love NY”. Additional functionality includes events (party notices, etc.) and messages (email). Users can interact in a number of ways. You can add friends (must be mutually accepted), and you can also “poke” another member, which is a way of saying “hello”. The biggest use of the site appears to be dating…as you can see from this very funny independent movie that I found on FaceBook. It’s long, but I highly recommend it if you are trying to get a feel for the service. FaceBook has three methods of producing revenue. sponsored groups – examples included Apple, EA, etc.